Well, it's been a very minty weekend, but since it's already ten p.m., I'm just going to share yesterday's treat with you for starters. This poor bugger has been suffering in the basement freezer for several months. See, on top of their previous "Sundaes To-Go", Friendly's came out with at least three more flavors this year. For some strange reason they just refer to the new ones as sundaes now. 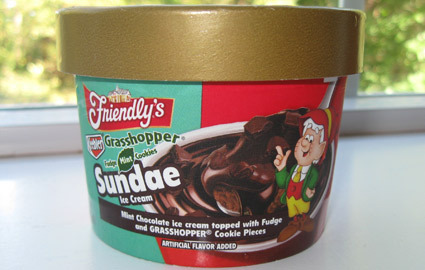 This is the Friendly's Keebler Grasshopper Fudge Mint Cookies Sundae. That's a mouthful and I haven't even cracked the container yet. It's Mint Chocolate ice cream topped with Fudge and GRASSHOPPER Cookie Pieces. This guy joins the new birthday cake sundae I spied in March and the new peanut butter something sundae (my apologies since I literally just saw the peanut butter one this morning). Well, they certainly didn't skimp on the cookies did they? As always, my disclaimer is that I do not love mint, but every now and then I get the urge for it so I knew that sooner or later this little bugger should hit the spot. Thankfully for me, it did so very well. Now remember that I said you need to let these sundaes defrost a bit before you start. Luckily, it was already soft so I dug right in. 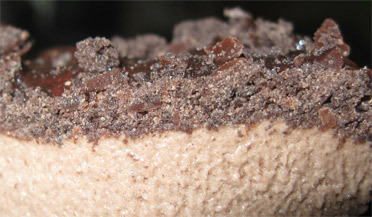 As you can see above, the cookie layer is quite thick. There was plenty of melting sauce to go around. Friendly's makes good ice cream, so no worries there. I actually really enjoyed this treat. If you dig mint in general, or maybe like mint cookies in particular, I say give this one a try. They are usually at $1.35-$1.50 a piece and you can always grab an assortment while you are there. I think you should do more reviews of friendly's desserts from their restaurant. I've always been curious about their friend-z varieties like strawberry banana, strawberry shortcake and chips ahoy. 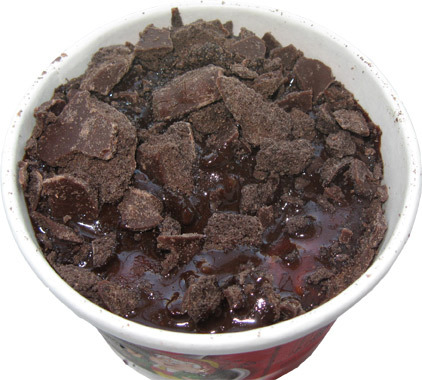 I always liked the brick and mortar friendlys, I wish we had more of their dessert cup range around my area. These ones aren't even on their site. Ahh i love mint ice cream this looks like my idea of heaven. I am fan of mint ice cream...it have a unique place in my life..